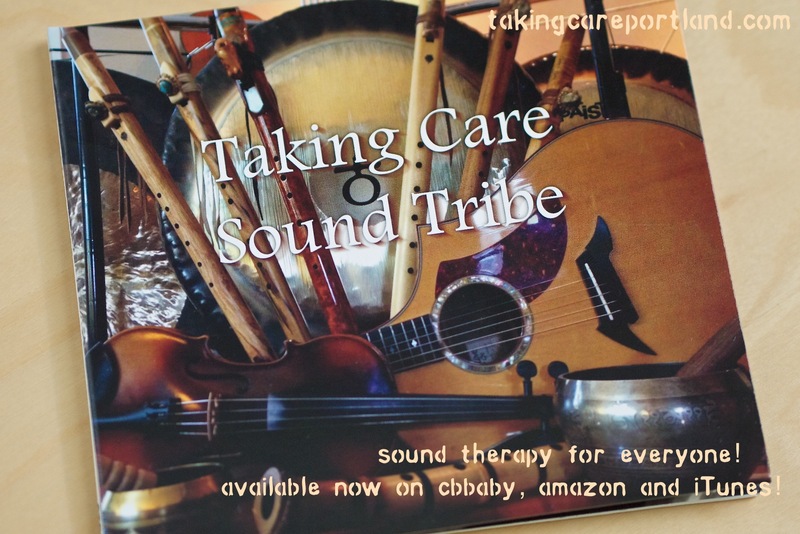 The Taking Care Sound Tribe shed blood, sweat, tears… and, a pancreas, making a sound therapy album of the highest calibre. The recording process brought our deepest vulnerabilities to surface. Splints were removed, playing with wounds not yet healed. 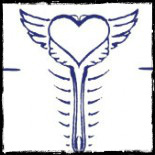 The making of a sound healing album is a conversation in compassion, holding space to truly hear one another. Not only in the music, but in the dialogue between takes. The actual time with instruments in hand is the smallest of parts. It’s a big challenge taking one’s spiritual practice and facing a microphone. One moment suspended. Every musician involved put their presence and thoughtfulness in the crafting of this music, all of it improvised in studio. It was recorded and engineered by Steve Frost in Portland, Oregon. The Taking Care Sound Tribe is Steve Frost, Sarah Grumbling, LMT, Marcia Muench, Rafael Otto and Hamid Shibata Bennett, LMT, CAMT. We weave guitar, violin, viola, harmonium, sitar, shakuhachi, cajón, djembé, Native American flute, gong, quartz and Tibetan singing bowls, voice and more into the mix! It would be a snazzy joy to share it with you! The majority of album sales will go directly to Taking Care Portland, a 501c3 non-profit developing community-based cancer survivorship in Portland, Oregon. The Taking Care Sound Tribe is curious to know what this music evokes in you? Do you listen in dance, in meditation, in the car, on your MP3 player, in your acupuncture, massage therapy or yoga studio? What’s your favorite track and why? Leave a comment and let us know! 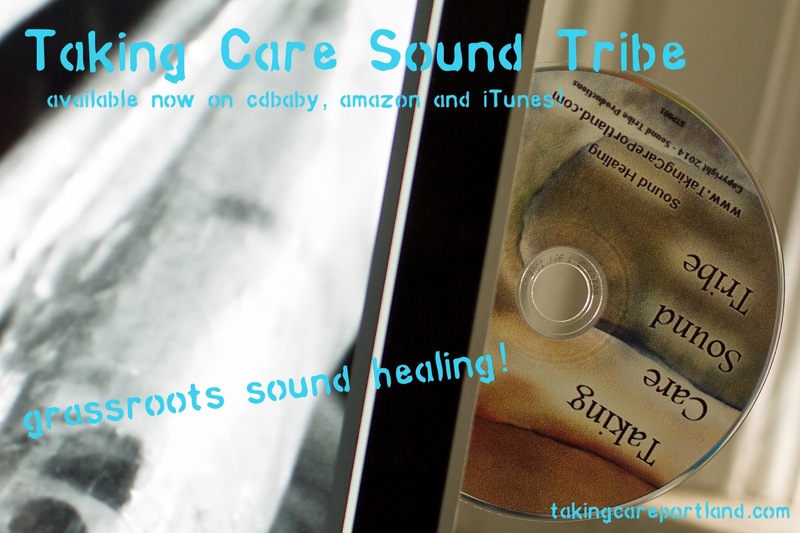 Taking Care Sound Tribe, available now in CD and digital download from CDBaby, Amazon and iTunes. Sound therapy, Portland style! It was Hot Wheels day in the studio! Plus, Hamid pushes the wrong button! How do you mic a harmonium?! Sarah Grumbling, LMT and Rafael Otto getting in the flow as Steve Frost sets up microphones. This entry was posted on July 9, 2014 by Hamid Shibata Bennett, LMT, CAMT in Music and sound and tagged acupuncture, amazon, cancer, cd, cdbaby, dance, healing, itunes, Kirtan, Massage, Massage therapist, massage therapy, meditation, music, music therapy, new age, new release, Oregon, Portland, sound healing, Sound therapy, survivorship, taking care cancer, taking care Portland, taking care sound tribe, thai massage, world, yoga.